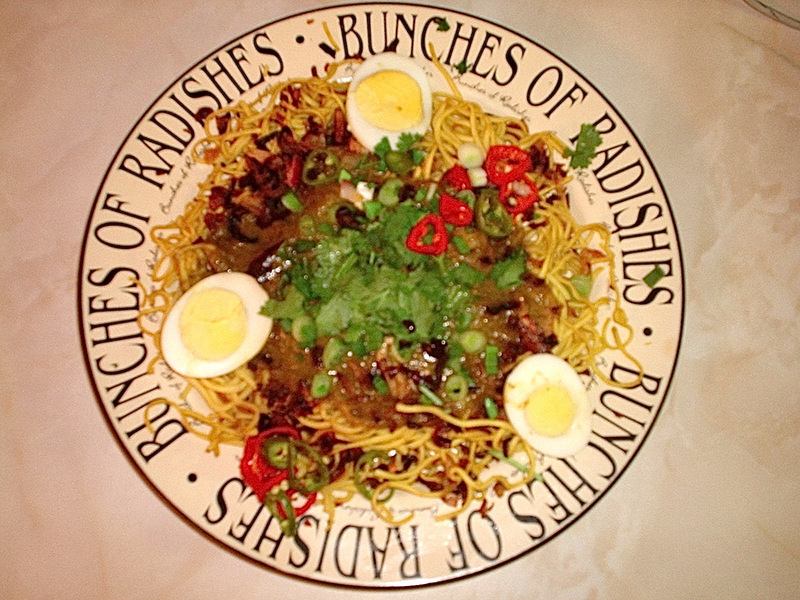 If one were to cross indian and Chinese food, and the result were successful, it would taste like this Burmese dish, a curry with many dimensions of flavor, served on top of egg noodles! This is an involved dish to make, but is a meal in itself. Recipe originates from the book “Asian Pasta” by Linda Burum. Peel and slice 12 garlic cloves crosswise. Fry them in 4 tablespoon oil until they are golden. Remove and cool. 1 bunch fresh coriander sprigs, trimmed. Heat the vegetable oil in an 8 to 12 quart pan or Dutch oven. Stir in the turmeric and cook it for one minute. Add the onions and cook on medium heat stirring occasionally, until the onions are limp but not browned, about 20 minutes. Add the garlic, ginger, cayenne, cumin, coriander and garam masala. Cook and stir the mixture about 1 minute. Add the chicken pieces and stir to coat them with the onions and spices. Add the cinnamon, bay leaf, and chicken broth, and simmer for 25 minutes. Mix the chick pea flour with 1 1/3 cups water, or grind the lentils to a flour in a blender or mortar and mix 3/4 cup of the resulting flour with 1 1/3 cups water. Stir the mixture into the soup. Add the coconut milk, cover and simmer for an additional 30 minutes. Thaw egg noodles if frozen. Put noodles in a large pot of boiling water and boil for 6-7 minutes. Drain noodles and stir in a couple of teaspoon of vegetable oil to keep them from sticking together and set aside.